Auch wenn es noch nicht ganz so aussieht: der boreale Wald‎ ist hier schon wieder aufgesprengt durch groessere Wiesen und Felder und, vor allem, ordentlich und rechtwinklig angelegte Strassen, ich vermute nummeriert und nicht mehr mit Namen versehen. In Alberta gehoert das so! Nix mehr Kurven und so’n Krams – geradeaus wird gefahren! In etwa 1,5 Std. Sollten wir in Edmonton sein. 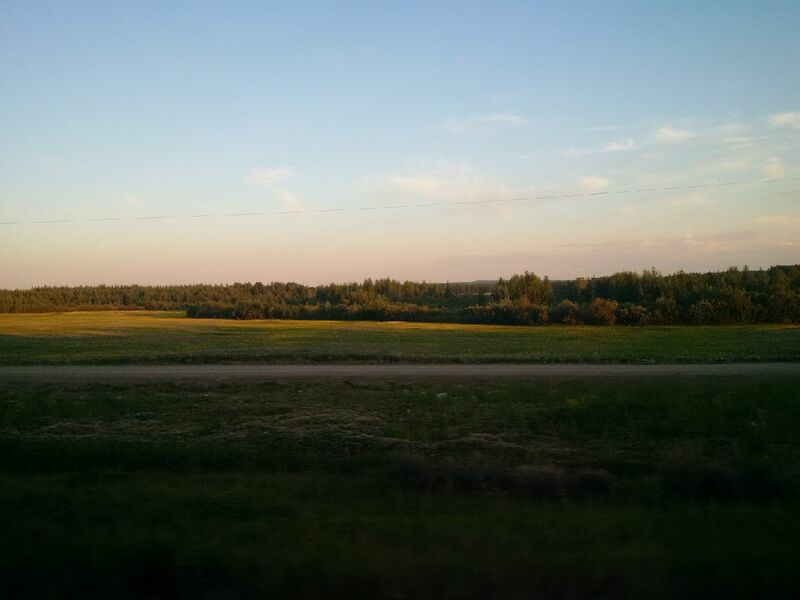 Even ‎though the picture is not quite clear on it: the boreal forest here is cut up by much bigger fields and pastures, and above all, by roads that are arranged in an orderly fashion, at right angles, numbered, not named, I assume. That’s how it’s done in Alberta! None, or at least not so much, of that curve and bend and up and down nonsense. Here, we drive straight! Another hour and a half, and we should be in Edmonton.